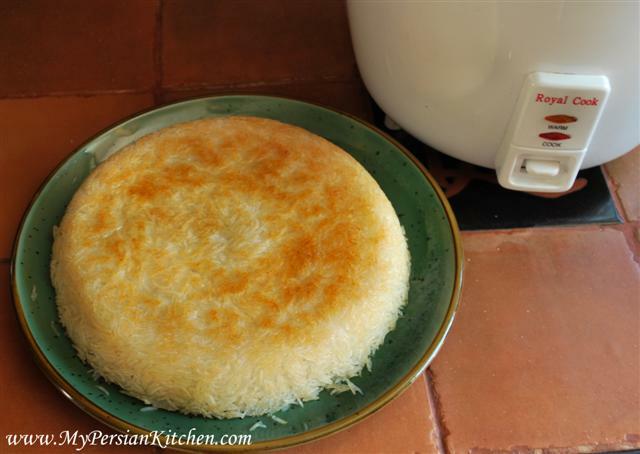 A few months back I wrote about Persian Rice Cooking Method, which is done on the stove. 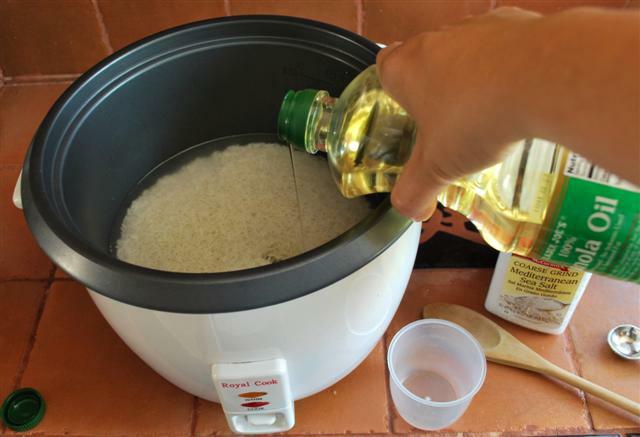 In a past post I have also talked about the difference between a Persian Rice Cooker and other rice cookers on the market. Fortunately, for all of us my regular reader Aaron saved the day by letting us know about the technological explanation. The big difference between Asian rice cookers and Persian is Fuzzy Logic. 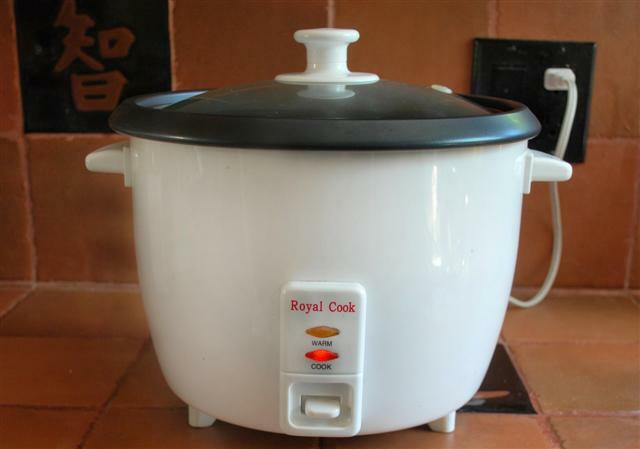 Fuzzy Logic is the system in most rice cookers to avoid burning, which makes Tahdig impossible. Another smaller issue is most Asian rice cookers the pot is not non stick rather it is aluminum. Indeed, Persian rice cookers have a non-stick interior which should be taken care of with much care. In fact, it is important to keep the surface of the pot scratch free. So, a big thank you to Aaron for his explanation. By the way, in recent months Aaron has started a blog of his own: Level Up Your Cooking. It is absolutely awesome and you will notice that he is very ambitious in the kitchen! Please be sure to check it out. I absolutely love my Persian Rice Cooker. It was given to me as a gift when I moved into my very own apartment in Redondo Beach in 2004. It was an awesome place. I knew I had to have it when I walked into the spacious kitchen and the lemon tree in front of my door pretty much sealed the deal. 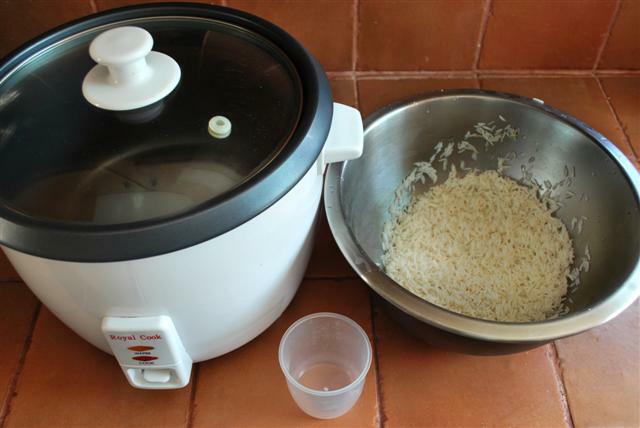 I use my rice cooker often to make rice because it is easy and a pretty quick way to make rice. It took me a while though to figure out the correct water vs. rice ratio. Persian Rice Cookers simply don’t have directions. I consulted with a couple of cookbook and also asked my mom. I found that when going by their directions the amount of water was too much. After some experimentation I have finally mastered the ratio that works out best for me. For this recipe I am using two cups of rice which is small amount made for The Sous Chef and I to consume during two meals. 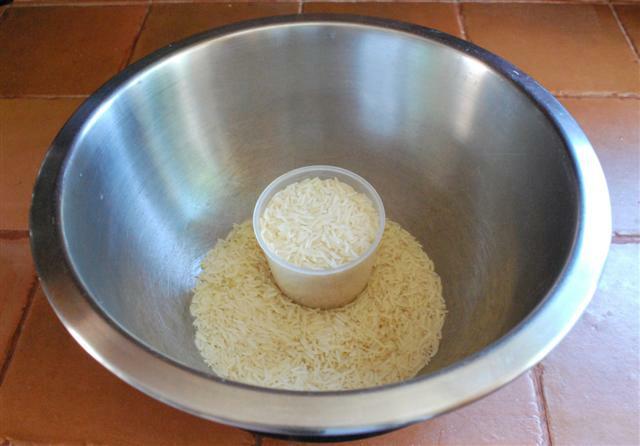 Since the ratio of water to rice is one to one you can increase the amount to your need. However, I would not go below two cups when making rice in a rice cooker. Place two cups of rice in a bowl. 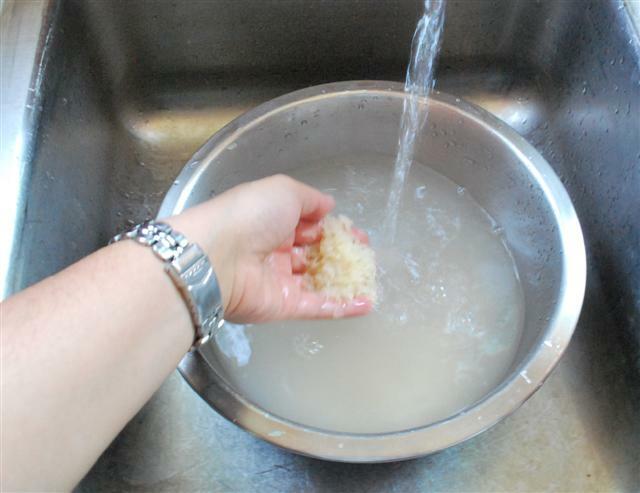 Wash rice well until water is clear. 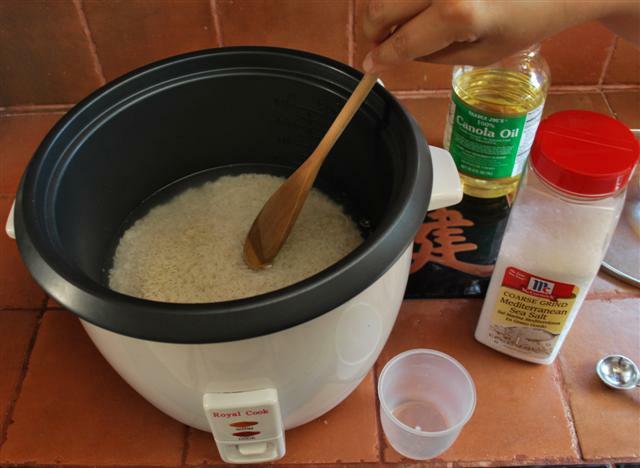 I find that it is best to soak the rice for a couple of hours when using a rice cooker. I soaked mine for about 3 hours. Once you are ready drain water. 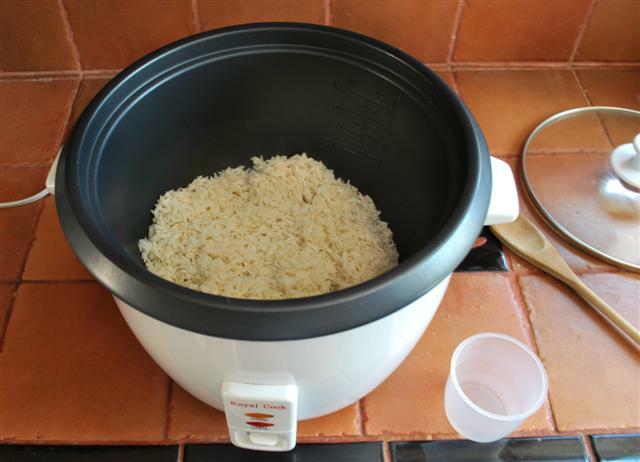 Load up rice in the rice cooker. 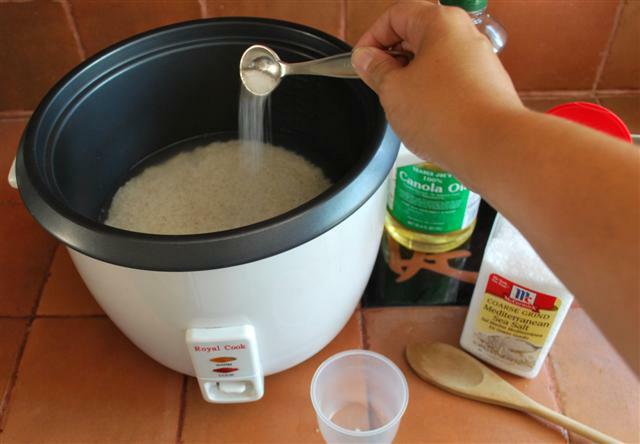 Use the same measuring cup that you used for rice to measure water. 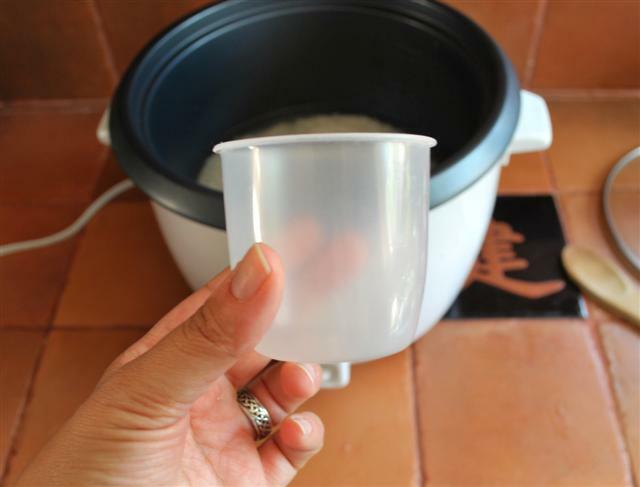 I always use my rice cooker’s cup when making rice. Add about half a teaspoon of salt. Add about 1 tbsp of canola oil. You can use butter instead of oil if you want. Just do not use olive oil. Give it all a nice and gentle stir. Cover and press the button to down to COOK. DISCLAIMER: The following is an extra step that I do. I find that it makes my rice come out the same as steamed rice in a pot. Traditionally, the rice cooker is loaded and left alone until done. This is what I do: I keep an eye on the rice until the water has been absorbed, which takes about 10 minutes for this amount of rice. 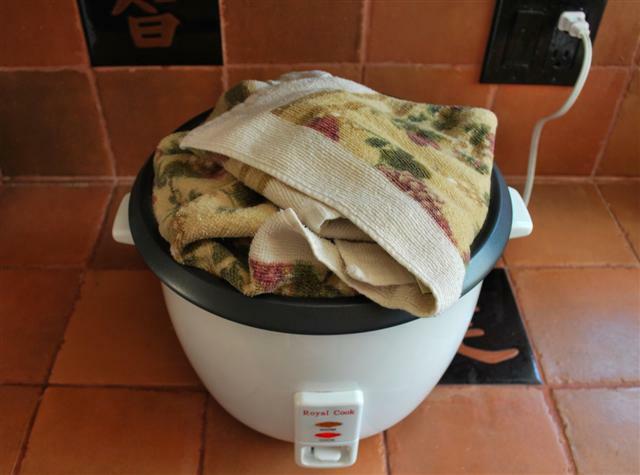 I place a kitchen towel over the lead of the rice cooker and wait for the rice to get done. Once the rice is done, the light will switch to WARM. You can either remove the rice from the rice cooker with a spatula…but who wants to do that when you can do it the pretty way? 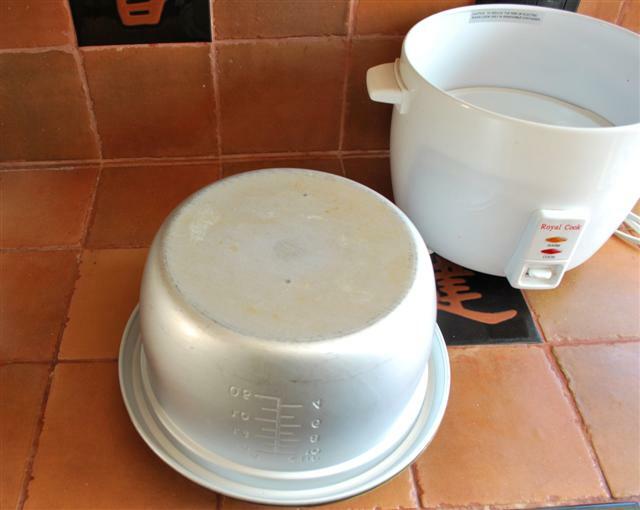 Place a plate on top of the rice cooker. Take a kitchen towel or kitchen mittens. Pull out the inside pot and place it on the counter upside down. Gently remove the pot and…..
Voila! Look at this beauty! 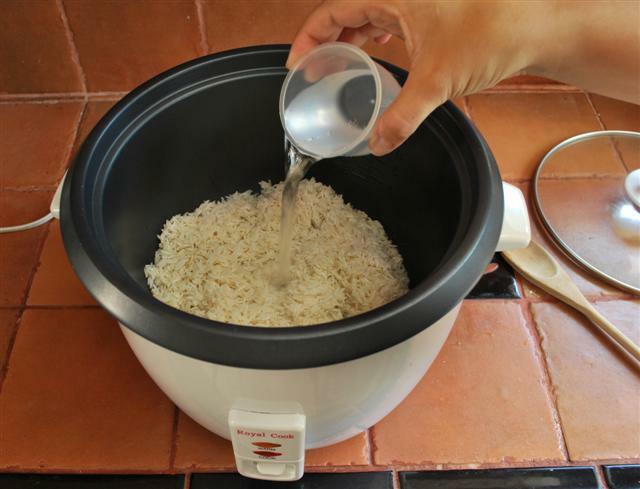 Making rice with a rice cooker is pretty much fool proof!!! 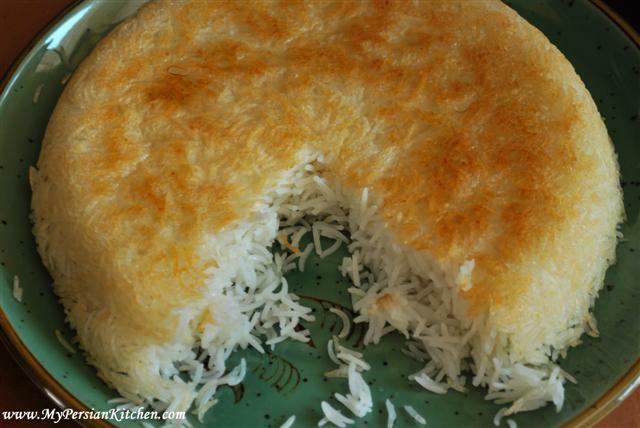 Look at that tahdig and how nice the rice looks inside! YUM! I just got a pars drc240. It has a dial. What amount of minutes should i set it for in this recipie? It says the light will go from red to yellow and back to red but i’ve never seen that happen nor do i u derstand why that should happen. And the english instuctions are so poor i have no idea how badly I am screwing this up. Nasreen, your guess is as good as mine. I don’t own one of those and don’t know how to operate that type of rice cooker. Hi, I have a Pars rice cooker, the 230 model, so I guess it’s a bit smaller. I turn mine on for 1.5 hours and it works perfectly. The timer only goes to 60 minutes so I have to add the extra 30 minutes sometime while it’s cooking. Sanam, thanks for writing your blog, it’s great. Thank you so much for your wonderful, beautiful blog! I have a question…you say absolutely do not use olive oil. May I ask what the reason for that is? Knowing the reason behind such tips I find helps me become more skilled in my cooking! Thank you for all that you are sharing! Hi, I’m sorry I asked that question about the olive oil before seeing that you already answered that question several times in the comments! I totally understand the taste reason. I actually for some strange reason feel that way about Canola oil myself. I can’t stand the flavor of it, and don’t like any dressings or other foods that have been “tainted” with the taste! I know some people must feel that way about olive oil. I *love* some olive oils, but have also tasted some with strong flavors I really dislike. Olive oil comes in a wide variety when it comes to flavor. I use light flavored olive oil for my pastries, or things that I don’t want any extra flavor added. When I make Tahdig on the stove top, I use olive oil with an almost buttery, nutty flavor, and I love the extra flavor that I think complements the basmati aroma. I would not use one with a strong olive flavor. I do not think the high heat is an issue with Tahdig, though? I looked up about that, because it was new info. to me. What I found said butter actually has a lower smoking point than olive oil, and Tahdig is not made over high heat. But it does get crispy…does that mean the bottom is getting heated to a high enough point to make the olive oil bad for you? Does that mean that butter would have the same problem? 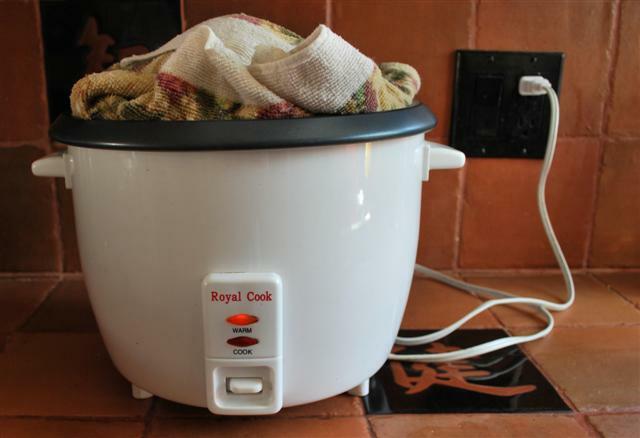 A few months ago, and after reading much on your site, I purchased a 10 cup Royal Cook rice cooker. I’ve used it probably 10 times, following your instructions/recipe… And it’s been WONDERFUL. Reminds me of my grandmother’s rice. Has this ever happened to you? I’m wondering if I did something wrong, or if it’s a faulty unit… And I’m kind of afraid to use it again now. Hadi, OH My! Lucky you for having so much tahdig!! But I know exactly what you mean, that’s not what you wanted. This has never happened to me and you are the first to tell about such thing. My assumption is that your rice cooker may be faulty. I’d try making rice one more time and see if it happens again. If it does, then I’d contact the manufacturer and see what they can do. Hi. 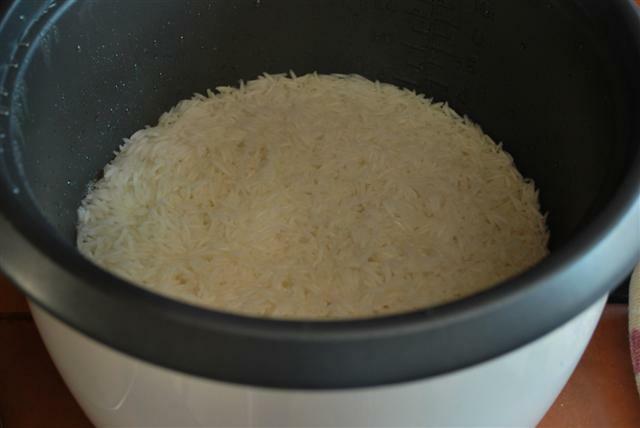 Have you tried making Sella (parboiled basmati) style rice in the rice cooker? If so, what is the ratio rice/water,etc. you recommend? 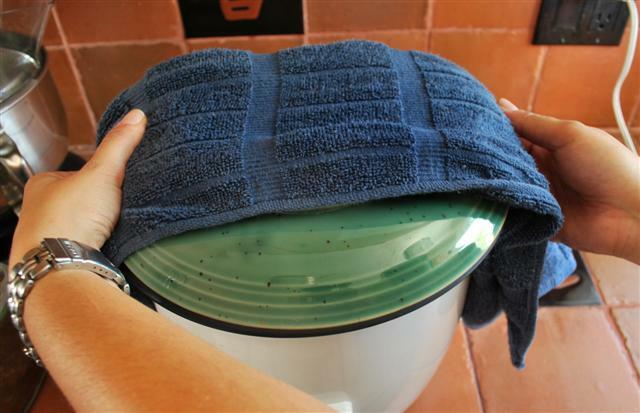 Also, do you leave the top open for 10 min, wait for the water to absorb and then close the lid w/ a paper towel/cloth towel underneith the lid? ZB, I have never used par-boiled rice in a rice cooker. 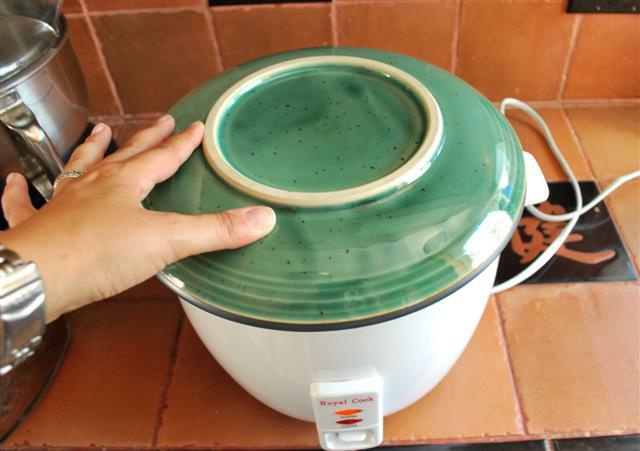 The lid is always on when cooking in the rice cooker. do you know what I should do if I needed to bring the rice to a party? Do I completely cook it at home, then unplug it, transport it, then plug it back in at the party? I need it to be served warm at the party. Your response is appreciated! Kelly, If you are making it in a rice cooker, then I would simply cook it at the party. I’m sorry if you’ve already covered this and I, somehow, missed it. Is the ratio of water to rice 1:1? I lOVE my Persian rick cooker, and wondered about making regular Uncle Bens rice in it. Or would be regular rice cooker be better for that? I was wondering if you’ve ever attempted to do the saffron/yogurt mixture in the bottom of the rice cooker. If so, how did it turn out? While I was writing that, mine was actually cooking, and we just finished dinner! It was amazing. I have a wolfgang puck rice cooker, and it allows for the crisping at the bottom (which I’d accidentally done with other rice dishes). I did the yogurt and saffron and some of the soaked/rinsed rice in the bottom. Then I put the rest of the soaked/rinsed rice on top with the oil, salt, and water. It was so good. I can’t wait to make it again. Thank you so much for sharing both this and the original method. Phyllis, I have no idea as usually use Basmati. You’ll have to test it out to see how it comes out. Shahin, it varies from rice cooker to rice cooker. For mine the perfect ratio is 1:1. You’ll have to experiment with yours. 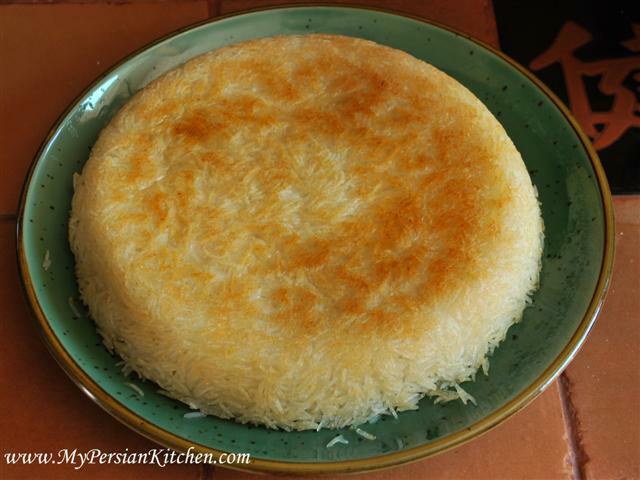 Hi, Have you made other kinds of Persian rice in the rice cooker, like adas polo or eslamboli polo both without meat? Ferryual, yes, I have made and posted Adas Polow and Baghali Polow.